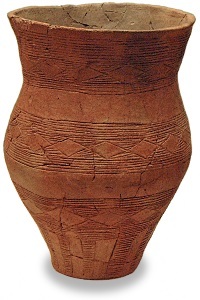 An early (c.2450–2250 BC) Beaker with ‘all-over-cord’ decoration – a style mostly found north of the Humber. The Amesbury Archer’s copper knives. The Amesbury Archer’s gold ornaments. One of the Archer’s barbed and tanged flint arrowheads. At the beginning of May 2002, the richest Beaker burial known in Britain was uncovered. It was discovered by archaeologists investigating a site at Amesbury, some 3 miles south-east of Stonehenge, in advance of building work. The grave (originally, it probably had a timber lining, and may – there is no surviving evidence – have been covered by a low burial mound) was that of a 35–45 year-old man. Radiocarbon dating places his death around 2350 BC. Typically for the period, he had been laid on his side, in a crouched, as if sleeping, position. Examination of his skeleton revealed that, at some time during his life, he sustained a serious injury to his left knee, leaving him with a painful bone infection and a pronounced limp. He was also suffering from a tooth abscess, and the infection had burst through his jaw. This rather sickly individual, however, was clearly of high status. He was buried with around a hundred objects, which, say Wessex Archaeology who made the discovery, is “ten times the usual number of finds from other graves”. 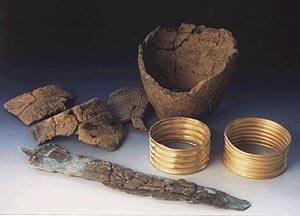 There were the pieces of five Beakers (the usual is just one per grave), three copper knives (one of which, judging by its position, he may well have been wearing), a bone pin (which might have been fastening an item of clothing, such as a leather mantle), a shale ring (identified as a belt-ring), two gold ear or hair ornaments, a ‘cushion stone’ (used in metalworking*), four boar-tusks, many flint tools and flakes, a red deer spatula used for working flints. Seventeen ‘barbed and tanged’ flint arrowheads were found in positions which suggested that a quiver full of arrows had been scattered over his lower half. (It seems reasonable to suppose that there would have originally been a bow also, but, like the arrow shafts and any clothing items, it had long since rotted away). He had two sandstone ‘wristguards’ (to protect his wrists from the bow string), one of which he was wearing. * These latter items led to the man being nicknamed ‘the Amesbury Archer’. (He was also referred to, somewhat whimsically, as ‘the King of Stonehenge’.) Close by, there was another, smaller and less richly furnished, grave, dating from about the same time as (perhaps slightly later than) the Archer’s. Its occupant was a 20–25 year-old man. He too had been buried with a pair of ear/hair ornaments. * Both the Archer and the younger man exhibit the same peculiarity in the bone structure of their feet, demonstrating that the two men were related. Oxygen and strontium isotope analysis of their tooth enamel suggests that, whilst the Archer had grown up in the vicinity of the Alps, the younger man had grown up in southern Britain. Perhaps the younger man was the immigrant Archer’s British born son? Stages in the evolution of axe-heads during the Bronze Age. 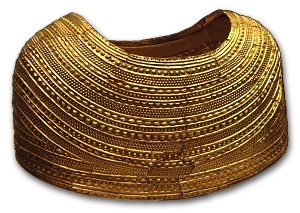 The astonishing skill of early metal-workers is apparent in the decorative gold items they produced. Gold does not tarnish, so these survive (though a little mangled in some cases) looking as lustrous as they did on the day they were manufactured. 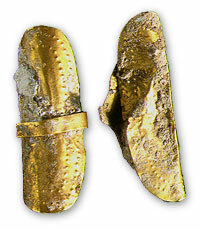 The Lockington Hoard, dated to around 2000 BC, comprises the fragments of two Beakers, a copper dagger (typical of Brittany, and still in the remains of its wooden sheath) and two, embossed gold-sheet, armlets. One of the armlets (originally, they would probably have had a leather backing) has five plain encircling ribs, whilst the three shaped ribs of the other armlet may be simulating a strings of beads. The Hoard was found in a pit within a burial complex, but it wasn't actually with a burial. Intriguingly, the pots were already broken and weathered when they were placed on top of the dagger and armlets. In Wessex,* dating from the first half of the 2nd millennium BC (i.e. 2000–1500 BC), are several very richly furnished barrow burials – the most famous of these being the Golden Barrow and, richest of all, Bush Barrow. * At one time these burials were thought to represent a unique ‘Wessex culture’, established by a fresh wave of migrants from Brittany. Today, however, the tendency is to accept that they are simply a development which demonstrates the growing wealth of a local elite. It’s not, though, just in Wessex that works of exquisite gold craftsmanship dating from this half-millennium have been found. In 1833, labourers shovelling stones from a mound (known to locals as Bryn-yr-Ellyllon, i.e. Goblins’ Hill) on the outskirts of Mold, in Flintshire, North Wales, uncovered a badly decayed skeleton. The skeleton was wearing the crushed remains of Mold Gold Cape, upon which there was laid a quantity of amber beads. In 1835, most of the cape was sold to the British Museum by the land’s tenant. Only one of the beads ever reached the Museum. It seems likely that the rest were converted into cash by the labourers – along with pieces of the cape. Some of these pieces have, over the years, turned up and been reunited with their fellows. Restoration work, using ‘reinvented technology’ to replace the missing sections (about 15% of the cape), was completed in 2002. 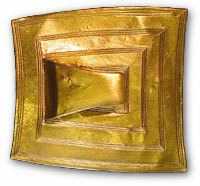 * Mold Gold Cape was beaten from a single ingot of gold, and then meticulously embossed. 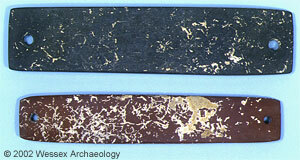 Bronze strips, found with the cape, seem to have been used to strengthen the structure, and it appears to have had a textile lining. Despite the reinforcements, it would have been a relatively fragile object, and there is evidence that it had undergone repair. Presumably, it was worn on ceremonial occasions (arm movements would have been seriously restricted), and, clearly, only by someone of slim build – possibly a woman. The Rillaton Cup (top) and the, somewhat less fortunate, Ringlemere Cup (bottom). In 1837 (? ), workmen, looking for building stone, found the rotted remains of a human skeleton, in a stone cist set into the edge of “a large mound of earth and stones which had been standing from time immemorial”, at Rillaton, on Bodmin Moor, Cornwall. * The grave’s occupant had been buried with a metal “rivet”, “some pieces of ivory”, “a few glass beads”, a bronze dagger, and a gold cup. It seems that the cup was inside an “earthen vase” – the latter being smashed during the excavation. Being Duchy of Cornwall Treasure Trove, the objects were sent to King William IV, and thereafter remained in the royal household. On the death of King George V (who is purported to have used the cup to house his collar studs), in 1936, the cup and dagger (the other items have not survived) were handed over, on permanent loan, to the British Museum. The cup’s body was beaten from one piece of gold, and the handle is attached by rivets (which pass through lozenge-shaped washers). In November 2001, a metal-detectorist, scanning a recently harvested potato-field, discovered a similar gold cup at Ringlemere Farm, near Sandwich, Kent. The cup probably owes its present, somewhat bent, condition to a modern plough. It was found within, what turned out to be, the ploughed-out vestiges of a henge that had, in effect, been converted into a round barrow. Archaeologists looked for a grave, from which the cup might have been dragged by agricultural activity, but failed to find one. 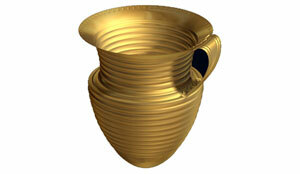 The Ringlemere Cup’s method of construction is like the Rillaton Cup, but it is a little larger and the gold is thicker. A spearhead from Flag Fen. At first, life in the Bronze Age appears to have carried on in much the same way as it had in the Neolithic – rather than having a fixed abode, people apparently followed an itinerant way of life. By 1500 BC, however, fundamental changes were underway. People were settling down. Field systems were established. 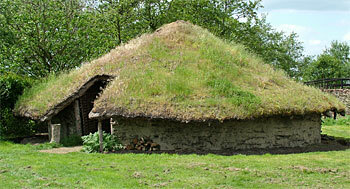 Houses – typically, these are round in plan, hence ‘roundhouses’ – began being grouped together into hamlets. * Indeed, perhaps because permanent settlements were providing the sense of place previously supplied by monumental structures, henges and stone circles were abandoned too. The focus of religious activity seems to shift to watery places, such as rivers and bogs, in, or near, which metalwork was deposited, presumably as an offering. The archaeological record indicates that inhumation fell from favour, and cremation became the standard method of treating the dead. The deposition of cremated remains in round barrows also declined – the trend was towards burying cinerary urns in ‘flat cemeteries’. As in the previous archaeological periods, though, many bodies must have been dealt with in ways that have left little trace – such as committing them, or their cremated remains, to the water. In fact, a surprising number of buried metalwork hoards dating from the closing centuries of the Bronze Age are found by metal-detectorists. For instance, between January 2003 and March 2004, just in Kent, eight were found. Most of these had been scattered by ploughing, but by far the largest – 185 pieces of metalwork – was found in a pit below the ploughsoil, at Crundale. * The presence of copper ingot fragments might indicate that the hoard was a stash of scrap metal, collected by a metal-worker, destined for recycling. This is the traditional interpretation of such finds, and they are sometimes called ‘founders' hoards’. However, in this case, some objects seem to have been deliberately rendered unfit for purpose. This phenomenon has been found with other hoards, which raises the possibility that, rather than being simply forgotten heaps of scrap metal, they too are ritual deposits. Late Bronze Age (c.1000 BC – c.800 BC), leaf-shaped blade, sword. This page was last modified on 10th April 2019. Broadly speaking, a round barrow is an earthen mound (or a mound of stones, ‘cairn’, particularly in the north and west) covering a central burial. This burial (it can be of a corpse, i.e. inhumation, or of cremated remains) is known as the ‘primary’ – often ‘secondary’ burials were subsequently inserted into the mound. 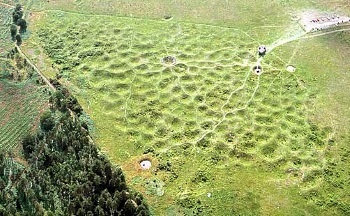 Round barrows – which can be found as stand-alone monuments, or grouped together in a ‘barrow cemetery’ – are divided into several types. Found at Rudston (5 miles west of Bridlington), in the Yorkshire Wolds, by Canon William Greenwell, and in the possession of the British Museum since 1879. This Beaker was associated with the burial of a female adult, whose remains were in a mound which contained many burials. The Beaker has all-over-cord decoration, i.e. rings of twisted-cord impressions covering the whole of the vessel’s exterior. Found in Hemp Knoll bowl barrow, Wiltshire, in 1965, and now on display in the British Museum. The knives have tangs to which handles (probably wooden) would have been fixed. The copper (perhaps the knives themselves) came from northern Spain and western France. They may have been worn around the edge of the ear, or on braided hair. As to the function of these stones, the larger ones would obviously make very good anvils; the smaller ones could have served as small anvils, heavy hammers, polishing stones, or for a combination of these purposes. The Archer’s cushion stone measures approximately 91mm x 65mm x 30mm, and weighs roughly 260g. The Archer was wearing the black wristguard. The red one was placed adjacent to his knees – along with one of the copper knives, the shale ring and the pair of gold ornaments. It seems probable that there would also have been some items of clothing originally. A simple leather cuff would have been perfectly adequate to use as a wristguard, so it seems likely that stone ones were status symbols. Above: the Archer’s companion. His gold ear/hair ornaments were found inside his jaw. These axe-heads were found by metal-detectorists and posted on the UK Detector Finds Database. They are shown to scale. The top one is the earliest type: a ‘flat axe’. 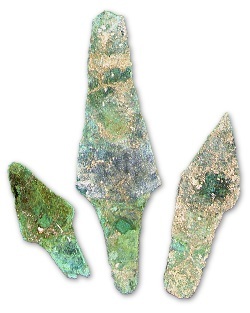 Copper and early bronze axe-heads were of this type. The sample in the photo (75mm x 50mm), which is believed to be an early (c.2200–2000 BC) bronze example, was found at Ewyas Harold, Herefordshire. The axe-head is formed by simply pouring molten metal into a one-piece, open topped, mould. Clearly, a problem with these flat axes is securely attaching the head to the handle. Later developments addressed that problem. In the middle is a ‘palstave axe’ (155mm x 60mm), of c.1400–1200 BC, found near Codsall, Staffordshire. Requiring a two-piece mould to produce, the palstave axe has flanges and end stop, which provide the seating for a projecting, split, handle-stub. Stub and axe-head would then be tightly bound together. The bottom axe-head represents the ultimate in Bronze Age axe development – the ‘socketed axe’. This one (104mm x 45mm), from c.1000–800 BC, was found at Rainham, Essex. In order to cast the socket, which fits onto the handle-stub, a three-piece mould has to be used. The axe-head is held secure by passing thongs through the loop and around the handle. Some scholars prefer to refer to the first three centuries or so of the British Bronze Age, when Bronze itself is not evident, as the Chalcolithic period or Copper Age. Photograph: Historic England Educational Images. The Lockington Hoard was discovered in 1994, by archaeologists excavating an Early Bronze Age barrow cemetery, ahead of road construction, at Lockington in Leicestershire. Radiocarbon assays of two samples taken from the organic remains attached to the dagger produced the date-ranges 2580–2200 BC and 2190–1880 BC. The latter range is most compatible on typological grounds. This is a controversial topic in archaeology, but it would be true to say that though Beaker People can still be found in books or heard about in guided tours, for the past twenty years or so few practising archaeologists have believed in them. Instead, the fine pots and other artefacts are thought to be a still visible manifestation of some lost fashion, ritual practice or social phenomenon that spread from one community to another, subtly changing as it passed. ‘Beaker People in Britain: Migration, Mobility and Diet’ (Antiquity Vol. 90, Issue 351, June 2016), paper freely available online. The Ringlemere Cup was purchased, for £270,000, by the British Museum, in 2003. There are no plans to straighten-out the Cup, but a computer realisation of its original shape has been produced. It is estimated that the Ringlemere Cup was originally 123mm high with a rim diameter of 109mm. It weighs 183.7g. 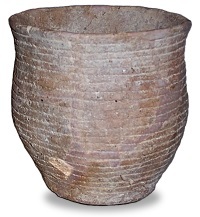 The Rillaton Cup has a rim diameter of 85mm (give or take), and it is estimated that it was originally 95mm high (its base has evidently been flattened since its discovery, so that it will stand). It weighs 76.6g. Images courtesy of the British Museum. A reconstructed Bronze Age roundhouse at Flag Fen, based on the ground-plan of one found in the vicinity (pictured in 2008). In common with many Bronze Age roundhouses, this one has a circle of internal roof-supports, suggesting that a heavy roof-covering, i.e. turf, was used. Excavations, in 2015–16, at Must Farm, not 3 miles from Flag Fen, where structural components of Late Bronze Age (i.e. c.1000 BC – c.800 BC) roundhouses, that were built on stilts above a small river, have been very well preserved, indicated that a mixture of turf, clay and thatch was used in the roof-covering. Interestingly, it seems that the house-walls were made of wattle panels, as expected, but no evidence has been found that the panels were covered with daub. * Flag Fen: A Concise Archæoguide (2012). Exposed timbers at Flag Fen are preserved by sprinkling with, cooled, filtered water. 48 socketed axe-heads (including fragments of). 33 sword or dagger fragments. 33 cast copper ingot fragments. 14 spearheads (including fragments of). 3 razors (including fragments of). It would seem that, at least some, Bronze Age men were clean-shaven. and 6 objects which had been inserted into sockets – in one case, into the socket of a broken axe-head, which was then squashed around them; in another case, jammed into the socket of a spearhead. It is this feature which may suggest that the items were being deliberately placed beyond use. This sword is one of three found in a hoard at Tarves, Aberdeenshire, Scotland. 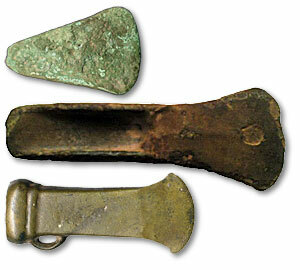 The rest of the hoard comprised a pommel, a chape (the metal tip of a scabbard) and two pins. The hoard, minus a sword and a pin, was presented to the British Museum, by the Earl of Aberdeen, in 1858. Late Bronze Age swords are the first weapons uniquely devised for warfare.… [they] are designed for slashing and only make sense when used for fighting in groups. These swords have leaf-shaped blades, balance well forward of the wrist and some even have blunt points. Unlike thin-bladed rapiers, these swords have hilts cast as an intrinsic part of the weapon and can therefore be used for slashing without coming apart. Swords are more likely to disable than kill, but few weapons are as useful in a mêlée. A rapier- or spear-user requires accuracy and time, and leaves himself open to attack from the side; while the user of an axe or club becomes exhausted in prolonged battle. Late Bronze Age swords must have been invented by societies already used to war, and aware of the limitations of other weapons. I have examined several hundred Late Bronze Age swords and would maintain that the majority bear signs of edge damage consistent with blade-on-blade impact. They tend to have numerous nicks and small wave-like distortions of the edges. The nicks are unlike the signs of attempted complete destruction often found on blades in ritual deposits, and the rippled blades cannot have been caused by faulty casting. It would be surprising if sword users were not the élite of warriors. Bronze swords are far from easy to make – the clay moulds themselves require careful preparation and only expert casting can prevent the creation of hidden flaws. Hammering and heating the edges repeatedly, without cracking the metal, is particularly difficult in tin bronze. Nonetheless the vast majority of blades have micro-structures which show this was done with consistent results. ‘The Beaker phenomenon and the genomic transformation of northwest Europe’ (Nature Vol. 555, Issue 7695, 8th March 2018), pre-publication version of paper freely available online. What could have caused such a rapid disappearance of Neolithic Britons?… There is no evidence to suggest a hostile invasion, although it does, of course, remain a possibility. Other scenarios include an environmental change or catastrophe that the indigenous population could not adapt to, or new diseases that the Beaker migrants may have brought with them against which the local people had no natural resistance. Originally, Wessex was the Anglo-Saxon kingdom of the West Saxons (see The Birth of Nations: England). To archaeologists discussing the prehistoric period, Wessex is shorthand for an area of southern England covering Dorset, Wiltshire, and parts of Somerset, Berkshire and Oxfordshire (as defined by Mike Parker Pearson in the Introduction to Stonehenge, 2012). It is perhaps not strictly true to say that bronze was invented in Britain. The very earliest combination of tin and copper is found in Anatolia, but Near Eastern bronze contained less tin, in less standardised quantities, than was found in British bronze. Put simply, it was inferior bronze. In Britain, bronze was produced from the outset with an almost standard composition of 8 to 12 per cent tin, ensuring the optimum mix of qualities.… Along with Afghanistan, Cornwall is one of only two possible major sources of the tin used in bronze throughout Europe after about 2000 BC. No prehistoric mines have yet been found in Cornwall but this is hardly surprising: the landscape has been eaten away by coastal erosion and turned upside down by the vast scale of the post-medieval tin industry. All prehistoric evidence may have been destroyed. There are, however, several Bronze Age copper mines known in Britain (mainly in Wales), the largest of which is at the Great Orme, Llandudno, where a complex of shafts and galleries descends more than 70 metres. Mining was evidently underway there by 1800 BC, peaked around 1700–1500 BC, and continued to about 600 BC. See: Food Vessels and Collared Urns. The main account of these events is by Edward Smirke, Vice-Warden of the Stannaries of Cornwall and Devon, and antiquary, in a paper entitled ‘Some Account of the Discovery of a Gold Cup in a Barrow in Cornwall, AD 1837’, published in 1867 (the Archaeological Journal Vol. 24). The discovery of the Rillaton Cup is said to have happened “as long ago as the spring of 1837”. However, in 1851 Daniel Wilson, Honorary Secretary of the Society of Antiquaries of Scotland (in The Archaeology and Prehistoric Annals of Scotland, Chapter 5), citing as his source a letter by “W.T.P. Shortt, Esq of Heavitree, Exeter”, had made a passing reference to the Cup being found in a cairn “which was accidentally broken into in 1818”. In 2016 a better preserved tripartite wheel (i.e. 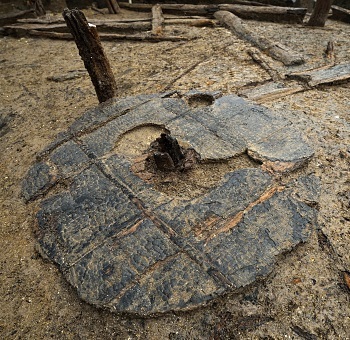 the body of the wheel is made from three wooden boards) was found at, nearby, Must Farm (photo below), but it is later – thought to date from 1100–800 BC. 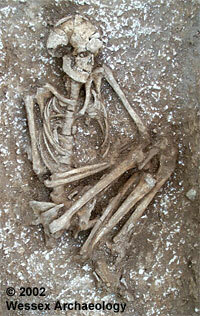 Photograph: Dave Webb, © Cambridge Archaeological Unit. In August 1998, Seahenge (as it was soon christened), a circle of 55 oak posts with an upturned oak-stump at its centre, was exposed on the beach at Holme-next-the-Sea, Norfolk. Dendrochronological analysis has indicated that all the oaks (it is likely that about 15–20 trees were used) were felled in the spring or early-summer of 2049 BC. The stump was evidently dragged into position using ropes made from honeysuckle stems. 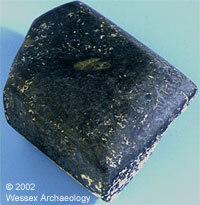 Analysis of tool-marks has shown that Seahenge was constructed using at least 51 metal axe-heads. 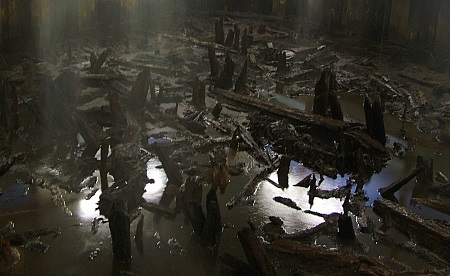 Conserved timbers from Seahenge are now on display in Lynn Museum. The important question does not regard the form of their tombs, so much as the sequence of the two peoples in the order of time and civilization. As to this, it is contended that the long-heads were the true primeval race; and that they were succeeded by a taller, more powerful, and more civilised people, who gradually extended themselves and became dominant, through a great part, perhaps nearly the whole, of the island.… The brachycephalous people, or round-heads, who buried in the round barrows, were more civilized than the dolichocephali [i.e. long-heads], and may be inferred to have brought with them the more common use, if not the first knowledge, of bronze.… There is no proof, nor is it in the least probable, that the brachycephalic extirpated the earlier dolichocephalic people. It is far more likely that they reduced them to slavery, or drove them, in part, into the interior and western parts of the island. When once subdued to obedience, they may have lived with them on friendly terms, and even mingled with them in domestic relations. In some districts, the braehycephali would probably entirely replace the earlier race; whilst in others, the dolichocephali would live on under the supremacy of their more powerful neighbours. A mingling of the remains of the two peoples in their later tombs must almost certainly have ensued. The closing phase of the Neolithic period and its transition to the Bronze Age were marked by invasions from the Low Countries and Rhineland of people of a different physical type, round-headed and sturdy, who buried their more important dead in individual graves beneath round barrows. They were warriors, skilled in the use of the bow, who tipped their arrows with barbed flint heads. They also seem to have been hearty drinkers, probably of beer, since a characteristic drinking-vessel or beaker usually accompanied a burial. For this reason they are called the Beaker People. Their invasions came in two main waves, extending over several centuries between about 2400 BC and 2000 BC.